All the exterior shots turned out better with my iPhone than my DSLR, go figure. One of the more divisive films playing at Venice last September was Terrence Malick's To the Wonder, which vaguely follows the relationship between an American man (Ben Affleck) and a French woman (Olga Kurylenko), from their blossoming romance in France to the decay of their attraction once he brings her home to the midwest. Rachel McAdams plays another love interest and Javier Bardem is the local priest. Confusion ensues. At the press screening I attended, the majority of the audience booed at the end. To put things in perspective, when Malick dropped The Tree of Life in 2011, it was not so much a revolution for the filmmaker but rather a telling sign of things to come. Seriously, not even the actors really knew what was going on. Malick was too busy shooting his next feature to attend the festival, so watching the press junket from the media lounge I remember poor Kurylenko fending off all these tricky questions on her own. (Affleck, I assume, was back in LA perfecting Argo). However there is one magical scene early on, when the couple is still in love, where they're frolicking in the tidelands of Normandy against the backdrop of Mont Saint-Michel (whose nickname lent itself to the film's title). These precious few seconds, out of the movie's 120+ minute run, made the deepest impression on me, and I've been dreaming about that place ever since. Mont Saint-Michel is certainly photogenic, but only from certain angles; which is to say discounting the myriad school groups, tourists and renovation projects. Connected to the mainland by a narrow bridge, what used to be a sacred and dangerous pilgrimage has been all but overtaken by commercialism. Whereas in previous centuries visitors had to brave the rising tides and pockets of quicksand to get to the abbey, nowadays shuttle buses conveniently drop them off right in front of the walled city's main entrance. 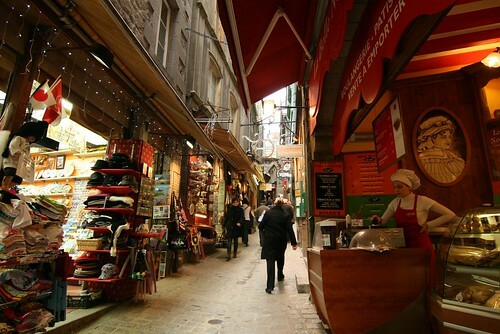 Inside, the lone, winding street that slopes upwards toward the abbey is lined with souvenir shops, hotels, crêperies (the thin pancakes are the regional specialty of nearby Brittany) and restaurants with identical menus proudly displayed in French, English and Japanese. On a good day in the off-season, it might not be so choked with tourists. Having gained entrance to the abbey by mid-morning, during certain parts of the tour I was so alone that the click of my camera's shutter in the cavernous stone halls echoed louder than my footsteps. But as the afternoon wore on and bus loads of tourists continued to arrive (by the sounds of it many of the school groups were daytrippers from England), not even taking the back alleys or the ramparts were sufficient to avoid the crowds. I left through the same door I came in that breached the outer wall, pausing and turning back along the causeway to snap more pictures. Each time, though, it became harder and harder to dodge the buses, tractors and cranes threatening to sneak into the frame. If I reached my hand out in front of me, blocking the ground teeming with people, I could see only the abbey rising from the vast tideland. Yes, it was still magnificent. Maybe, like the film, it's best understood in bits and pieces. To see it as a whole simply ruins the effect. Stay: Au Bon Accueil. Run by a husband and wife team of British expats, this is probably the only hotel in the area that offers pick up/drop off at Mont Saint-Michel and the nearest train stations. Rides and breakfast are included in the price. Eat: Crêpes are the local specialty, whether they're the buckwheat, savory galette variety or the sweet kind. On the island, La Sirene offers a quiet dining room above street level that's probably more comfortable than eating takeaway, as the other crêperies have you do. Near Au Bon Accueil, the Telegraph bistro has a 10f€ set menu with savory galette, sweet dessert crêpe, coffee and your choice of wine or cider. (Take the cider - it's another Brittany tradition). 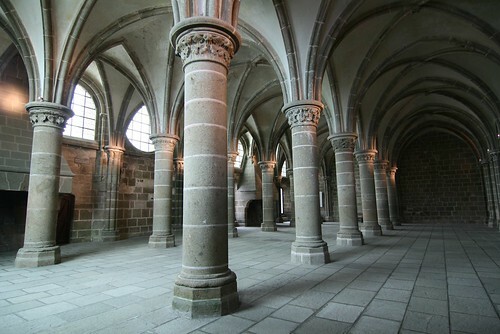 See more of Mont Saint-Michel on Flickr.